ANTIQUE MAP Africa Industry STEAM SHIP ROUTES Submarine Cable Routes RAILWAYS Caravan Routes etc. 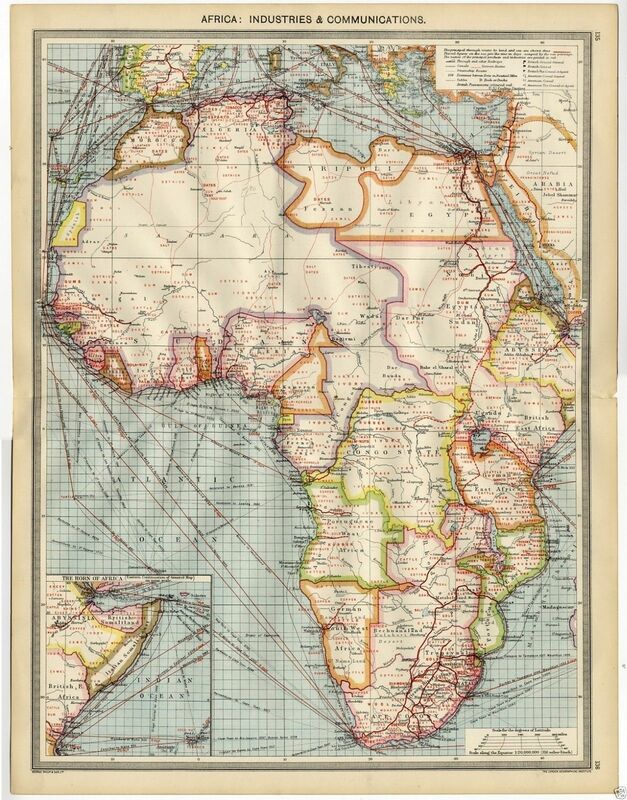 The map shows the principal through routes by land and sea, including Caravan Routes, Railways, Canals, Steamship Routes, Submarine Cables etc. It also marks the locations of British Consul General, Consul, and American Consuls etc. With distances to and from various ports in nautical miles. It has an original 'as published' fold to the centre and is blank on the reverse (blank apart from titles and a key map). It measures overall 510 x 393 mm ( 20 x 15.25 inches ) approximately, and is suitable for mounting and framing. There is a little age yellowing and handling marks to edges. It originally would have been in an atlas, edge mounted so as to avoid damage to the map, and not stapled. This map will be sent rolled in a protective postal tube.